Screening of a new documentary by artist Michelle Angela Ortiz as part of her Familias Separadas project, developed from interviews with families detained at the Berks Family Residential Center. Do you want to build Asian American Pacific Islander community power? Join VietLead, Asian Americans United, Pennsylvania Immigration & Citizenship Coalition (PICC), and Asian Pacific Islander American Vote (APIAVote) for our Spring AAPI Civic Engagement Training! Our action-packed Saturday will feature conversations about the broader goals of AAPI voter engagement, organizing skills like canvassing and phone banking, a primer on the 2019 Philadelphia municipal elections, and an introduction to the 2020 census. Our training will feature a focus on native language outreach as well as English with breakout sessions on how to engage voters in MANDARIN CHINESE, VIETNAMESE, and KOREAN! Food and drinks will be provided! Please register! https://tinyurl.com/AAPIPower Include any dietary restrictions/limitations you may have in the registration form. Please contact Wei Chen at <wei.chen@aaunited.org> or Dong Yoon Kim <dongyoonkim@paimmigrant.org> with any questions or concerns! This month’s topic: Deferred Enforced Departure (DED), including information on recent extension for Liberians. Know Your Rights Workshop / Conozca Sus Derechos! Through this workshop you will be equipped with an understanding of your basic rights, or the rights of someone you may know who encounters Immigration and Customs Enforcement. Additionally, we will walk you through the necessary steps for your family to be prepared in the event that you or a loved one is detained. CWS Lancaster is a bipartisan not for profit agency working to equip individuals- regardless of race, religion, nationality, political opinion, status, or membership in a particular social group with the tools necessary for stability and self sufficiency in our community. With the increase in the number of Vietnamese and Southeast Asian detention and deportation in recent years, VietLead will be training volunteers to accompany impacted families to ICE check-ins. As a community, we have learned that when community members show up to support impacted folx during their check-in, ICE is less likely to detain them. As such, through this training, we hope that you will be ready to accompany our community when needed! Stay up to date on Facebook. Please contact Chị Thư at info@vietlead.org | 267-713-9089 if you have any questions. CLS’ Energy Unit is hosting a FREE Utility Clinic on Saturday, March 23rd from 2-5 pm at Face to Face in Germantown (123 E. Price Street). All of the utilities, as well as LIHEAP and UESF will be in attendance, and we will have advocates to help clients work with and negotiate with the utilities. Information and registration is on our website: https://clsphila.org/news/register-upcoming-cls-utility-clinic-march-23 or interested clients can call Rebecca McCord at (267) 443-2676. Curious about college? Confused about options for financial aid? Are you excited, but your family is nervous? Learn about: Financial Aid, Admissions Policies at Pennsylvania Schools, Resources for Parents and Students, DACA, and more! This workshop will equip participants with an understanding of the basic rights with respect to Immigration and Customs Enforcement and the opportunity to practice exercising them. Additionally, we will walk attendees through the steps that families and employers can take to be prepared in the event that a loved one or employee is detained. Modules 4 & 5 will be conducted on the same day. Language interpretation available upon request. Los módulos 4 y 5 se ofrecerán el mismo día. ¡La interpretación está disponible a pedido! Navigators learn how to use and complete the eligibility-screening tool under the supervision of an attorney. This training is part of a series of six. Los navegadores aprenden a usar y completar la herramienta de preselección de elegibilidad para beneficios migratorios bajo supervisión. Este taller es para de una serie de seis talleres. Register here. Navigators will learn about the requirements for U.S. citizenship and how to complete a citizenship application under supervision. This training is part of a series of six. Los navegadores aprenderán sobre los requisitos para la ciudadanía y cómo completar una solicitud bajo supervisión. Este taller es para de una serie de seis talleres. Register here. Module 6 will be conducted on the same day. Language interpretation available upon request. El módulo 6 se ofrecerá en Ingles. ¡La interpretación está disponible a pedido! Module 6 focuses on learning the basic presentation and training skills that Navigators will need to effectively present information to others in their communities. This training is part of a series of six. Register here. El Módulo 6 se enfoca en aprender las habilidades de capacitación que los Navegadores necesitarán para presentar información de manera efectiva a otras personas. Este taller es para de una serie de seis talleres. Registrarse aqui. The first module provides an overview of U.S. immigration law to help Navigators understand the functioning and shortcomings of the U.S. immigration system. This training is part of a series of six. Register here. What is a Community Navigator? Community Navigators are community members who receive specialized training to provide quality immigration services for their communities in an empowering and effective way. The Pennsylvania Immigration and Citizenship Coalition (PICC) will be hosting a series of trainings in Lancaster from November 7th to November 17th, 2018 to give community leaders the skills and knowledge to assist their peers in accessing resources and understanding their right. Interpretation and childcare are available upon request for all sessions. El primer módulo proporciona una descripción general de la ley de inmigración de EE. UU. Este taller es para de una serie de seis talleres. Registrese aqui. ¿Quieres son los Navegantes Comunitarios?Los Navegantes Comunitarios son miembros de la comunidad que reciben capacitación especializada para proporcionar servicios de inmigración de calidad a miembros de sus comunidades. La Coalición de Inmigración y Ciudadanía de Pensilvania (PICC) organizará una serie de talleres en Lancaster del 7 de noviembre al 17 de noviembrede 2018 para capacitar a líderes comunitarios con las habilidades y el conocimiento necesario para ayudar a sus vecinos a acceder a recursos legales y comprender sus derechos. Interpretación y cuidado de niños están disponibles bajo petición en todas las sesiones. Modules 2 & 3 will be offered on the same day. Interpretation is available upon request! Los módulos 2 y 3 se ofrecerán el mismo día. ¡La interpretación está disponible a pedido! Navigators will learn about the rights of immigrants when interacting with police and immigration officers. This training is part of a series of six. Los navegadores aprenderán sobre los derechos de los inmigrantes cuando interactúen con la policía y los oficiales de inmigración. Este taller es para de una serie de seis talleres. Register here. This module focuses on understanding what immigrant communities can do to protect themselves and their families from deportation. This training is part of a series of six. Navigators learn how to complete deportation defense plans and packets. Los navegadores aprenden cómo completar planes y paquetes de defensa contra la deportación. Este taller es para de una serie de seis talleres. Registrate aqui! Learn about the current policies around language access and language assistance at PennDOT in Western Pennsylvania. This is an open community infosession. Information will be presented by the Community Justice Project (CJP). Since 1998, more than 16,000 of Southeast Asian American community members from Laos, Cambodia and Vietnam, have been issued orders of deportation, but more than 14,000 are living in the country in a state of limbo, uncertain of when ICE will once again try to detain them. This aggression on our community follows the Trump Administration sanctions on Cambodia and Laos, the biggest Cambodian and Vietnamese detention round up in 2017, and the biggest deportation of Cambodian immigrants in 2018. More information and RSVP on Facebook. Please bring your friends, family, and signs to share! Contact info@vietlead.org for questions! Por razones de tecnología y falta de participantes, hemos decidido mover el entrenamiento por internet de Navegantes Comunitarios programado para el día 24 de enero de 6pm- 8 pm a un entrenamiento en persona en Casa San Jose (2116 Broadway Ave, Pittsburgh, PA 15216) en Pittsburgh. Las personas interesadas en realizar el entrenamiento por internet lo pueden hacer el día martes, 12 de febrero de 6pm -8 pm. Join the first #ShutDownBerks call in day of 2019! Now that Governor Tom Wolf has started his second term, it is time for him to take action to end family detention in PA.
See the Facebook event for more information and resources. January Youth Call: 2019 Kick-OFF! learning how to engage with immigrant rights work. We will cover different topics each week. Topics are selected by our youth membership. We use zoom for our video calls. We suggest that you use your computer so you can see and be seen by participants. The goal is to keep people connected throughout the state. If you don’t have a computer or a video camera you can use your phone and join like a regular call. Aquinas Center Immigration Legal Services will be hosting a KYR event on December 15th. We will be working with CSS Immigration Legal Services and the Mexican Consulate as a part of our Immigration Outreach Series. CSS Immigration Legal Services will also be conducting free legal screenings to Mexican citizens after the evening’s program. Monthly Youth calls are every 2nd Wednesday of the month. This call is for youth ages 14-25 in PA interested in learning how to engage with immigrant rights work. We will cover different topics each week. Topics are selected by our youth membership. Learn about the ITIN number, how the tax reform will affect ITIN holders, and learn your rights if confronted by ICE. After the workshops, get screened for possible immigration relief by immigration attorneys, accredited representatives, and trained volunteers. Come learn about the requirements to apply for U.S. Citizenship. For more information please contact Mr. Tuan Bui at 717-236,9401 or tuan@isc76.org. The public comment period on Trump’s public charge rule closes December 10. We have until then to prevent the Trump Administration from forcing immigrant families into poverty. Join us at a special event on Monday, Dec. 3 to learn more about the issue and submit your comments – every comment is essential. You can also meet some of the local organizations that are working to help your immigrant neighbors. Share on Facebook! Join CWS-Lancaster to learn more about the proposed change to the public charge rule and how you can take action to stop this harmful policy. Este taller sera tomado acabo en Español. Learn about the ITIN number, how the tax reform will affect ITIN holders, and learn your rights if confronted by ICE. After the workshop, get screened for possible immigration relief by immigration attorneys. This call is for youth ages 14-25 in PA interested in learning how to engage with immigrant rights work in PA. This module focuses on understanding what immigrant communities can do to protect themselves and their families from deportation. This training is part of a series of six. Navigators learn how to complete deportation defense plans and packets. Los navegadores aprenden cómo completar planes y paquetes de defensa contra la deportación. Este taller es para de una serie de seis talleres. Register here. For more information, visit the event Facebook page here. Every week, PICC and our volunteers register to vote hundreds of New Americans at their citizenship ceremonies in Philadelphia. Before every election, we the people we register to make sure they have the information they need to vote for the first time! 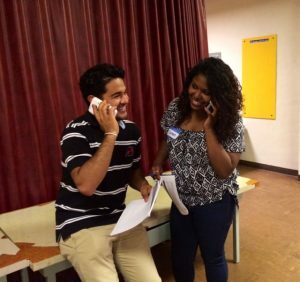 Help us mobilize New Americans to the polls this year by volunteering at one or more of our GOTV phone banks. Anyone interested can sign up directly for one or all dates using our volunteer sign up here. We will have food available. No prior phone bank experienced required as we will be training volunteers at the beginning of each shift. Volunteers should bring a laptop if they have one. Please contact Prudence Powell at prudencepowell@paimmigrant.org or Carlos A. Gonzalez at carlosgonzalez@paimmigrant.org if you have any questions. The Bhutanese Community Association of Pittsburgh cordially invites all of their neighbors from throughout the greater community to join together in solidarity against hate as we honor the victims of the Tree of Life tragedy. We will gather united in our support of the Jewish community with the knowledge that together, we are stronger than hate. The phone banks will take place from 5:30-8:30 PM at ACLAMO Family Centers in Norristown. Lunch will be provided. Language interpretation and childcare available upon request. Registration is required. Register now! Contact Carlos Adolfo Gonzalez, Statewide Capacity Building Coordinator, at carlosgonzalez@paimmigrant.org if you have any questions. El almuerzo será proporcionado. Interpretación de idiomas y cuidado de niños disponibles bajo petición. Registro es obligatorio ¡Regístrate ahora! Si tiene alguna pregunta, comuníquese con Carlos Adolfo González, coordinador de capacidades, .al carlosgonzalez@paimmigrant.org. Call In Day: Governor Wolf End Family Detention! Call Governor Wolf and demand he take action to protect immigrant families. Stop being complicit with Trump/ICE. Governor Tom Wolf and the Pennsylvania Department of Human Services have the power to issue an Emergency Removal Order on the Berks County Detention Center, an action that would ensure the facility can no longer be used as a prison. It is not only their moral obligation to keep families out of jail but their legal responsibility. FAMILY DETENTION IS ILLEGAL. On October 10, 2018 the Department of Homeland Security published the offical notice of its proposed change to the public charge rule. Publication of the rule has opened up a 60 day comment period, ending on December 10, 2018. It is important that all individuals and agencies opposed to this rule submit comments to ensure this harmful rule change does not go into effect. This webinar will cover how to gather stories and use the Protecting Immigrant Families tool to submit comments. On this webinar, Maripat Pileggi from Community Legal Services of Philadelphia will provide a brief overview of content in the proposed rule and provide guidance on how individuals and agencies can submit comments. Register Today! Login information for the webinar will be emailed to you upon completion of the registration form. Pennsylvania is one of two states in the nation that hosts a prison for immigrant children, known as the Berks County Detention Center, the others being Texas. Families have reported verbal abuse, workers’ rights abuses, medical neglect and in its first year of operation a mother was raped in front of other families. October’s vigil will be led by Bishop Peggy Johnson & Eastern PA Conference United Methodist Rapid Response Team. Please join us as we continue to lift our voices for the individuals who continue to be detained in the Berks County Detention Center. This information session will discuss the proposed change to the public charge rule that may affect immigrants and their families who receive or plan to receive public benefits. Co-presented by Maripat Pileggi, Public Benefits Unit Staff Attorney at Community Legal Services. Esta sesión informativa tratara el cambio propuesto a la regla de la carga publica. Esta medida podria afectar a todos los inmigrantes y sus familiares que reciben o planean recibir bienestar o beneficio publico. Co-presentado por Maripat Pileggi, abogada del Public Benefits Unit en Community Legal Services. Learn how legal and community pressure strategies can elevate a removal case into a deportation defense campaign, including best practices and ethical considerations for collaborating with community partners. All lawyers and community members are invited to participate. For more information, contact Carlos Adolfo Gonzalez, Statewide Capacity Building Coordinator, at carlosgonzalez@paimmigrant.org. Presented by David Bennion, Executive Director of the Free Migration Project. There is a $30.00 registration fee. Register here! Two days of information on the changing situation of immigration with a special focus on immigrant students with Dr. Erika M. Sutherland. Sabías que si recibiste beneficios públicos podrías ser considerado/a como una carga pública y no poder acceder a muchos beneficios adicionales? Ven a averiguar mas y ayudarnos a luchar por nuestra comunidad. Do you know that the government is planning to consider us a public charge if we currently receive public benefits? Please help us fight these unfair new rules. Presentation: As many as 64,000 children adopted by US citizens between 1948 and 2016 may not have US citizenship. For decades, the US government allowed American parents to bring children into the country on a variety of visas, some of which do not guarantee access to citizenship. The Adoptee Rights Campaign (ARC) is a national organization led by adoptees without citizenship. ARC works to promote a legislative solution and provide assistance to the impacted population. We will discuss who is covered and who is excluded under the current law and how you can help. Join Welcoming Pittsburgh for an evening of activities for Pittsburgh residents who are interested in becoming U. S. citizens. The night will include a civic game show hosted by Bhutanese Community Association of Pittsburgh, legal providers to answer naturalization questions and provide free citizenship eligibility screening and application preparation assistance for qualifying low-income household applicants, and vendors across the city that offer free services to the public! Public Charge Rule: What is it and how will it impact PA? On September 22, the Trump administration released the text of the proposed public charge rule change and announced it would soon be published for comment. If the rule is ­finalized in its proposed form, this would mark a significant and harmful departure from current policy. PICC and Community Legal Services of Philadelphia are partnering to host a webinar to explain what is included in this proposal and what impacts the rule would like have on immigrant communities in PA if enacted. On the webinar, Maripat Pileggi from CLS will provide a deeper overview of content in the proposed rule, discuss updated messaging on this issue, and explain what you can do to take action now. Provided the rule is in fact published this week, we will also review the comment process. Login information for the webinar will be emailed to you upon completion of the registration form. September’s monthly vigil will be led by “Artists Against Family Detention.” Please join us as we continue to lift our voices for the individuals who continue to be detained in the Berks County Detention Center. Parking is available at the buildings across the road and down the hill from the center. More info on Facebook. The exhibit, titled “Shitholes,” aims to promote emerging and unknown contemporary artists not often showcased in typical galleries while challenging the current negative narratives that surround many nations across the globe. Live musical and artistic performances are from 5:30 p.m. to 7 p.m. The exhibit will give the audience the chance to get a better glimpse of what these artists and their countries of origin are really all about, and the hope is that a diverse mix of people will attend. Entry is free and open to the public; however, Le Chapeau Project will be accepting donations in hopes to help provide support to the Pennsylvania Immigration and Citizenship Coalition (PICC). Esta sessión informativa tratara el cambio propuesto a la regla de la carga publica. Esta medida podria afetar a todos los inmigrantes y sus familias que reciben o plenean recibir bienestar o beneficio público. This information session will discuss the proposed changes to the public charge rule, that may affect immigrants and their families who receive or plan to receive public benefits. The U.S. Department of Homeland Security has drafted changes to the “public charge” rules that will be harmful to many immigrant families and communities. This could have an impact on citizenship approval in the future. Come join us for a community orientation event to learn more about these changes and what actions we can take in opposition of the proposed rules. This event is a collaboration between Centro de Apoyo Comunitario, Community Legal Services and PICC. El Departamento de Seguridad Nacional a creado propuestas para hacer cambios a las reglas de que son cargos públicos. Esto puede impactar a familias inmigrantes y nuestras comunidades, especialmente en el futuro si usted quiere hacerse ciudadano Americano. Acompáñenos a esta sesión de información sobre la propuesta y los cambios que propone y como usted puede luchar contra ellos. Este evento es una colaboración entre Centro de Apoyo Comunitario, Community Legal Services y PICC. CASA will be hosting a citizenship clinic Thursday, September 20th, 2018, from 4:00 p.m. to 6:00 p.m. The event will take place at the CASA York Welcome Center 225 E Princess St, York, PA 17403. For a full list of the documents that should be brought to the clinic and information about fees, please call: 717.219.7974. RSVP on Facebook. Learn about the ITIN number, how the tax reform will affect ITIN holders, and learn your rights if confronted by ICE. After workshops, get screened for possible immigration relief by immigration attorneys, accredited representatives, and trained volunteers. Aprender sobre el ITIN, como los cambios en las leyes tributarias van a afectar a las personas que tienen ITIN y sus derechos si se enfrenta con ICE. Despues de los talleres, ser evaluado por posible soliciones migratorias por abogados de inmigracion, representantes acreditados y voluntarios capacitados. Effective strategies for initial and sustained contact with voters through canvassing, phone banking, and other means. Modules 4&5 will be conducted on the same day. Language interpretation available upon request. Los módulos 2 y 3 se ofrecerán el mismo día. ¡La interpretación está disponible a pedido! Navigators learn how to use and complete the eligibility-screening tool under the supervision of an attorney. This training is part of a series of six. Los navegadores aprenden a usar y completar la herramienta de preselección de elegibilidad para beneficios migratorios bajo supervisión. Este taller es para de una serie de seis talleres. Navigators will learn about the requirements for U.S. citizenship and how to complete a citizenship application under supervision. This training is part of a series of six. Los navegadores aprenderán sobre los requisitos para la ciudadanía y cómo completar una solicitud bajo supervisión.Este taller es para de una serie de seis talleres. Register here. El Módulo 6 se enfoca en aprender las habilidades de capacitación que los Navegadores necesitarán para presentar información de manera efectiva a otras personas.Este taller es para de una serie de seis talleres. Registrarse aqui. ¿Quieres son los Navegantes Comunitarios?Los Navegantes Comunitarios son miembros de la comunidad que reciben capacitación especializada para proporcionar servicios de inmigración de calidad a miembros de sus comunidades. La Coalición de Inmigración y Ciudadanía de Pensilvania (PICC) organizará una serie de talleres en Filadelfia del 29 de agosto al 8 de septiembre de 2018 para capacitar a líderes comunitarios con las habilidades y el conocimiento necesario para ayudar a sus vecinos a acceder a recursos legales y comprender sus derechos. Interpretación y cuidado de niños están disponibles bajo petición en todas las sesiones. This training will be conducted in English. Language interpretation available upon request. What is a Community Navigator? Community Navigators are community members who receive specialized training to provide quality immigration services for their communities in an empowering and effective way. The Pennsylvania Immigration and Citizenship Coalition (PICC) will be hosting a series of trainings in Philadelphia from August 29thto September 8th, 2018 to give community leaders the skills and knowledge to assist their peers in accessing resources and understanding their right. Interpretation and childcare are available upon request for all sessions. Modules 2&3 will be offered on the same day. Interpretation is available upon request! Los módulos 2 y 3 se ofrecerán el mismo día. ¡La interpretación está disponible a pedido! Navigators will learn about the rights of immigrants when interacting with police and immigration officers. This training is part of a series of six. Los navegadores aprenderán sobre los derechos de los inmigrantes cuando interactúen con la policía y los oficiales de inmigración.Este taller es para de una serie de seis talleres. Register here. The U.S. Department of Homeland Security has drafted changes to the “public charge” rules that will be harmful to many immigrant families and communities. Come join us for a community orientation event to learn more about these changes and what actions we can take in opposition of the proposed rules. Guest Speaker: Maripat Pileggi, Community Legal Services of Philadelphia. Governor Wolf has the power to #ShutDownBerks but he refuses to take any action. Enough is Enough. He must end Family Detention in PA NOW! So we’re taking this campaign straight to his door. Join Pennsylvanians from across the state on August 20th as we mobilize and rally in the Capitol rotunda. Speak truth to power directly to the Governor’s office and demand they put an end to immigrant family detention in PA by issuing an Emergency Removal Order on the Berks County Detention Center. Sign up to hop on a bus or offer/share a carpool. RSVP and more info on Facebook. We are excited to announced the dates for this year’s Summer Immigrant & Refugee Youth Convening! All attendees will help with fundraising. PICC will provide and assist with a fundraising plan! ¡Estamos emocionados de anunciar las fechas para la Conferencia de Liderazgo de Jóvenes Inmigrantes y Refugiados! Este es un fin de semana dedicado a reunir a 30 jóvenes inmigrantes de distintas areas de Pennsylvania. Es una oportunidad para que jovenes compartan sus historias, y desarrollen habilidades de liderazgo,organización comunitaria y tengan la oportunidad de conocer a otros jóvenes que comparten experiencias y objetivos similares. Todos los participantes ayudaran a juntar fondos para este evento. PICC les ayudara a crear un plan de recaudación. REGISTRATE AQUI! : Aplicaciones empiezan el 1 de Junio, 2018 y terminan el 28 de Julio del 2018. August’s monthly vigil will be led by “Family Doctors Against Family Detention.” Please join us as we continue to lift our voices for the individuals who continue to be detained in the Berks County Detention Center. La Puerta Abierta/The Open Door is a Philadelphia based organization that works to ensure access to holistic, culturally and trauma-informed mental health support in the Latinx immigrant community through education, collaboration and the provision of pro bono services. Practitioners from LPA will share lessons learned from their work with the community about common migration and acculturation-related stressors as well as considerations in the current climate of increased immigration enforcement and uncertainty. This training will review the history of the center, how to lobby and the research that proves that the state of Pennsylvania can in fact issue an Emergency Removal Order. Learn more about the Campaign. July Call In Day: Governor Wolf Shut Down Berks! Pennsylvania is one of two states in the nation that hosts a prison for immigrant children, known as the Berks County Detention Center, the others being in Texas. July’s vigil will be led by Friends (Quakers) CALN Quarterly Meeting. Please join us as we continue to lift our voices for the individuals who continue to be detained in the Berks County Detention Center. RSVP & more event info on Facebook. Learn more about the Campaign to Shut Down Berks. This training will review the history of the center, how to lobby and the research that proves that the state of Pennsylvania can in fact issue an Emergency Removal Order. In response to increased immigration enforcement in Pennsylvania, PICC will be hosting a series of trainings on how to implement a coordinated community-based response to create safer communities and stop unjust deportations and detentions. Participants will learn about the “Community Resistance Zone” model, as implemented by Juntos in Philadelphia, and how to conduct strategic case-based campaigns that highlight injustices in the immigration system. This training will be interactive, allowing participants to practice new skills and plan how to begin a project in their local community. The training will be a full two days. Participants are expected to attend both days. NOTE: All PA is Ready! grantees participating in the Enforcement Resistance Initiative are required to send at least one staff (or equivalent) and 2-3 community leaders or volunteers to one of the three Enforcement Resistance trainings being offered. – How you can take action! Do you know if you qualify for any of these or other immigration programs? Are you an immigrant and a victim of crime or domestic abuse? Attend this immigration legal clinic to learn if you qualify. Information Session about Legal Permanent Residence and Citizenship and other Immigration programs such as U Visa, Temporary Protected Status (TPS), Legal Permanent Residence and Citizenship Information Session to learn how to make a Deportation Defense Plan and Packet. ¿Sabe si califica para estos u otros alivios migratorios? ¿Ha sido víctima de un crimen o de abuso domestico? Asista a esta clínica de Inmigración para saber si califica. Información sobre Residencia, Ciudadaníay otros Alivios Migratorios como Visa V, Visa U, y Estatus de Protección Temporal (TPS).Taller informativo de Paquetes y Plan de Defensa Contra la Deportación. Location: Community Hall (Basement), St. Laurence Church, 8245 West Chester Pike, Upper Darby, PA 19082. Please park in back parking lot. For more information, please contact Centro de Apoyo Comunitario at 610-713-5954. National Day of Action: Families Belong Together-End Family Detention! On June 30, immigrant communities and allies will be gathering in Washington DC and communities across the country. In Pennsylvania, local groups are organizing events in Philadelphia, Pittsburgh, Harrisburg, Doylestown, and more! See below for a list of local events. Allentown: 8:30am. Head to Philly! Details and RSVP on Facebook. Harrisburg: 12pm, Capitol Steps. Details and RSVP on Facebook. Philadelphia: 11am. Logan Square. Details and RSVP on Facebook. Pittsburgh: 11am. Market Square. Details and RSVP on Facebook. Pittsburgh: Get on a bus to DC! Details and RSVP on Facebook. Please review the Shut Down Berks Coalition Statement on Family Detention and Family Separation before attending the training. This administration’s policy of separating families at the border is horrific, and an extension of policies in place since 2014. The U.S. has been incarcerating asylum seekers as a “deterrent” since 2014 and holding families in inhumane conditions. Now, this administration has escalated by actively separating children from their parents. WE CAN HELP STOP THIS! Pennsylvania is home to the only publicly owned immigrant family detention center in the country. Shutting down the Berks Family Detention Center would show that Pennsylvania refuses to support the Trump policy of family separation and family detention. Join us and tell Gov. Wolf to #EndFamilyDetention in PA and SHUT DOWN BERKS! This policy of separating families at the border is horrific. It is also an extension of both existing immigration policy and the clear anti-immigrant and anti-refugee agenda of this administration. Since 2014, the U.S. has been incarcerating families seeking asylum as a “deterrent” and holding parents and children in inhumane conditions. It is time for ICE to stop terrorizing our communities, time to stop separating families, and time to end family detention! RSVP & more info on Facebook. Get screened for possible immigration relief by immigration attorneys, accredited representatives, and trained volunteers. Evaluaciones legales para posibles alivios de inmigracion realizado por abogados de inmigracion, representantes acreditados y voluntarios capacitados. On June 20th, World Refugee Day, we will be calling Governor Wolf to demand he take action to protect families seeking refuge in the U.S. Governor Tom Wolf and the Pennsylvania Department of Human Services have the power to issue an Emergency Removal Order on the Berks County Detention Center, an action that would ensure the facility can no longer be used as a prison. It is not only their moral obligation to keep families out of jail but their legal responsibility. FAMILY DETENTION IS ILLEGAL. More information on Facebook. June Monthly Vigil – #ShutDownBerks! Pennsylvania is home to one of three family detention centers in the country – and the only publicly owned one. Families have reported verbal abuse, workers’ rights abuses, medical neglect and in its first year of operation a mother was raped in front of other families. Governor Wolf has known for two years that his administration could remove families from the abuse and neglect that they have been enduring in the Berks County Family Detention Center. The Governor’s administration has done the bare minimum to right the immoral and illegal detention of immigrant families. Families continue to be abused under the state’s watch. June’s vigil will be led by Shut Down Berks Interfaith Witness with the ANNA Crusis Choir. Please join us as we continue to lift our voices for the individuals who continue to be detained in the Berks County Detention Center. RSVP on Facebook. 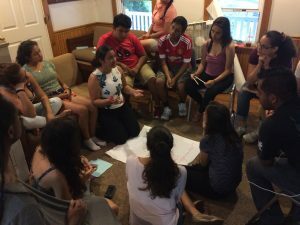 Everything you need to learn about our Summer Immigrant & Refugee Youth Leadership Convening! We are hosting 3 webinars in English & 1 in Spanish (pick when you are free) to go over what to expect for this years convening, fundraising plan and registration information including how to fill out forms and how to prepare. We are also excited to hear from you, what do you want from this year’s convening. All interested in attending should join. Webinar Dates: May 31, June 14 @6:30-7:30 PM Register for webinars here! En Español: Junio 6 y Junio @ 7:00 PM – Registrate aquí! Visit our website for more information regarding convening and registration. E-mail Maria Sotomayor at mariasotomayor@paimmigrant.org or call 215-832-3482 if you have any questions.